SEPTEMBER? ALREADY???! I’ll bee darned. That went fast. We had a decent Spring and a long hot summer. It looks like our summer semi-dearth is now upon us. Some abatement is however in the offing, as Rabbit Brush, Sage and Russian Sage are providing some nutrition and nectar. But, as far as the bees are concerned, Winter prep is in full swing. Drones will soon be booted out, honey stores will be finishing up. What do we do to be good stewards for their Fall management? We are looking for good stores, good bee population and healthy bees (low mite load, well nourished). Once we pull the supers off, partial uncapped supers can be fed back to the bees leaving it in a hive box on top of the colony. If your honey stores are iffy, feed colony from the top as opposed to the front. Reduce entrance. Use an extra deep box on top to make a robber-free feeding chamber. Your 2nd hive body should be full or almost full of honey to get the bees through winter. It takes about 60 lbs of honey for winter food use. If you feed after pulling the super, use 2 sugar to 1 water (hot water, but never boil or cook the sugar water). For September's inspection, we are working towards nest consolidation (crowding the girls, reducing empty spaces, equalizing hives if needed. Honey should be both above the brood chamber, and to the sides. Do not disrupt or modify this arrangement other than moving the brood area downwards. Be mindful that weak colonies are easily targeted for robbing. For this reason, feeding inside the hive directly above the brood area is a good idea. Reduce entrances if needed to make hives easily defensible. Honey removed in early September will have less moisture content than previous months, so you do not have to be as judicious about making sure that all cells are capped. Store honey frames VERY securely so that bees cannot access them. They are uncannily adept at finding and quickly raiding unguarded honey. Raiding scout bees will home in on the tiniest access to honey. And although they are bees, they have the memory of elephants: they will come back to the same place for days. (So your migraine goes on for days as you dodge the onslaught of the vigilantes, hell-bent on finding where you moved the ‘goods’ to). And that brings us to the topic of queens. Inefficient queens /low population hives can be combined with stronger hives to improve winter survival. (‘Execute’ the mediocre queen, and use newspaper method to combine). Queenlessness is often diagnosed by absence of brood/eggs. Often a queenless hive exhibits abundant stores of pollen stored in multiple frames (no brood to feed). This condition typically is followed by the development of laying workers. Signs of laying workers are multiple eggs per cell, eggs on the side of cells (opposed to one egg centered on the bottom), and drone brood development in worker cells. If queenless, (and healthy) you can combine with a queen-right hive as bumping up numbers this late in the season is difficult. Keep on the lookout for American Foulbrood as robbing season is imminent and AFB infected colonies make easy targets. AFB is highly infectious and early detection is important in its control (sour smelling, stringing, brown goop when you open a suspect cell). Dark old comb should be either replaced or moved out to the sides before winter so that the spring brood can have cleaner cells when the colony expands at winters end. Eventually, you can then pull the dark comb out. Varroa: Winter bees are now being formed. Hopefully you have taken your mite count and treated accordingly with your choice of treatment. If not then the HBHC treatment guidelines will help you with the treatment options that are still available at this time of year & with our current temperatures. Ideally however, if you treat for varroa infestation, mite treatments should have been finished up by now. But heck, we may get an extended summer to work with. The last ‘brood cycle’ is more like ‘pin the tail on the donkey’ anymore. Whatever you do, enjoy your girls, and may the peace they bring to your life, your garden, and your mind be their gentle gift to you. Many thanks to Kim from Backyard Bees of Bend for these September notes!! COBKA Club member Kate Riding had an article published in the July 2018 WAS Journal! You can read her article on page 11: https://orsba.org/wp-content/uploads/2018/06/was-journal-july-2018_reduced.pdf Great work Kate!! Our first Photography contest winners were announced! Thank you to all who participated! Check out all the photos here. Connie Axelrod's "Tip of the Swarm" won both First Place & People's Choice! Way to go Connie! Second Place went to "Gathering Pollen" by Kirsten Maerki - Congratulations Kirsten! 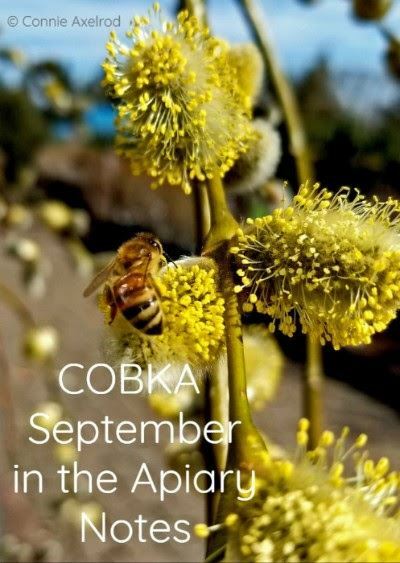 Third place winner was "Bee on Salix Caprea", also by Connie and featured as this month's In the Apiary photo. Thanks again to all! !